An attack by gold miners on a group of Yanomami tribespeople in Venezuela has left up to 80 people dead, according to campaign groups. The attack is reported to have taken place last month in the remote Irotatheri community, close to the border with Brazil. The miners allegedly set fire to a communal house, with witnesses reporting finding burnt bodies. The Yanomami have previously complained of miners encroaching on their lands. Due to the community's remote location, it took those who discovered the bodies days to walk to the nearest settlement to report the incident, according to campaign group Survival International. So far three survivors have been accounted for, according to Yanomami organisations. A statement from a network of Yanomami groups called on Venezuelan authorities to investigate the incident and to co-operate with Brazil to "control and watch the movement" of miners in the area. 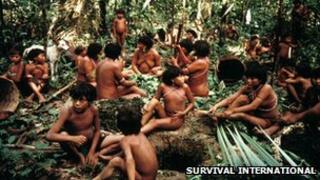 Yanomami activists say that the tribe has previously been targeted with threats and violence by illegal miners. "All Amazonian governments must stop the rampant illegal mining, logging and settlement in indigenous territories," said Stephen Corry, director of Survival International. In recent years the soaring price of gold on world markets has driven a surge in unlicensed gold-mining in many parts of the Amazon.